It is interesting that both players choose Lady Gaga's song as their walk on songs. Ding Junhui leads Jamie Burnett 8-1 after the first session. Ding hits big breaks of 52, 58, 84 along with two centuires 117 and 128. The only frame that Burnett wins is the eighth frame. Burnett has some chances to win more frames but he fails. Ding plays impressively and in control of the match. They will resume to play at 10am tomorrow. In the first frame of the session, break of 62 by Campbell is amazing. Pink and black are in bad positions. But Campbell made a few ammendments and a tricky fluke helps Campbell to win his first frame in the match. In the eleventh frame, Murphy had a break of 61 but he made a serious mistake when he does safety. 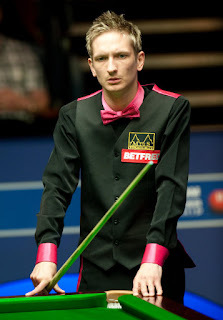 Campbell later misses a long red and it is his last potting in the Crucible this year. Murphy beats Campbell by wide scoreline 10-1. His opponent in last 16 will be Ronnie O'Sullivan/Dominic Dale. Things does not start very well for Stephen Hendry. Hendry misses balls when he is very close to the winning line. Joe Perry takes the opening frame after Hendry makes a mistake in safety. There is a re-rack in the third frame, the first re-rack in this year WC :-) The frame before mid-interval is quite close, Perry flukes the brown but it does not help him to win the frame. Hendry makes it all two to enter the mid-interval. Nice stuff from Hendry after the interval, he hits a 133 to lead 3-2. Stephen Hendry wins three frames in a row. He leads Joe Perry 6-3 by the end of the first session.